The first stage is relatively simple. Besides the engine, the fuel, and the oxidizer tanks, a center body section lies between the fuel and the liquid oxygen tank. This center body section houses electronic equipment to implement commands from the second stage where the rocket's "brains" reside. 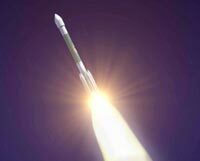 The first stage of the Delta II uses a Rocketdyne RS-27A engine to burn rocket fuel with liquid oxygen which is extremely cold ( -300° Fahrenheit, which is colder than any place on Earth). Although "rocket fuel" sounds exotic, it is basically kerosene. At liftoff, the rocket weighs 285,228 kilograms (628,820 pounds), of which only 1,070 kilograms (2355 pounds) is the spacecraft. Getting this heavy ship in motion takes the combined thrust of the RS-27A engine and the 9 strap-on solid rocket motors. The RS-27A generates nearly 890,000 Newtons (N) of thrust. * This power is roughly equivalent to 200,000 pounds of thrust, which is like compressing the water coming out of 2,000 fire hoses into one single hose about 4.7 feet in diameter. Once the spacecraft launches off the pad, the first stage engine needs more and more fuel to keep accelerating. A turbine-turbopump pushes fuel and oxygen into the combustion chamber. Liquid oxygen is also used to keep the main engine and its nozzle from getting too hot and overheating. That's very similar to the way in which water goes through a radiator in a car to cool the engine down. Two small precision engines provide roll control during main engine burn and attitude control after main engine cutoff before the second stage separation. If the rocket sensors detect that the rocket is starting to spin or roll, the engines will fire to stop the rotation. In order to make adjustments to the flight path, the engine is moved back and forth from the bottom of the rocket on large, straight gimbals by a fluid under pressure (hydraulic pressure). Gimbals are devices that keep objects suspended in a horizontal plane regardless of motion by the use of two rings mounted on axes at right angles to each other. Gimbals work in conjunction with gyroscopes that spin like tops. The gyroscopes note if they spin too far at one angle or another. If they do, they are getting out of balance, and therefore signal the gimbals to move. Like balancing a tall broom handle on the middle of your palm, the engine slides back and forth to keep the spacecraft upright and balanced.